Surveys of farm computer users reveal that they believe that accounting is their computer's most important function. Unfortunately, selection of the right farm accounting system has been a hit-and-miss exercise. Growth Path Accounting, introduced in the FarmSmart newsletter way back in 1985 and updated for 2014, provides the farm manager with step-by-step procedures for selecting and maintaining his accounting system. Farmers have varying levels of accounting experience and time available for bookkeeping. Each farmer's information goals are as unique and constantly changing as his farm business. Farmer-accessible education and training are both scarce and expensive. What are your information goals? Using this profile, GPA uses a "decision tree" to prescribe one of three growth paths leading to varying levels of practices and controls. To begin, you must review your past experience with accounting. 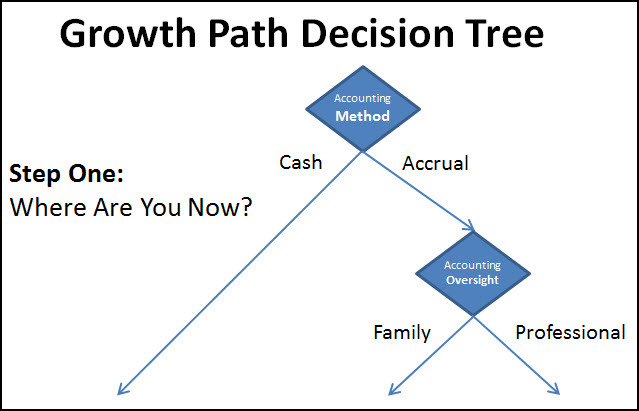 The first "branch" in the decision tree simplifies this by asking Question One: "Is your current accounting method cash or accrual?" You are using accounting software which records only checks and deposits to a checking account. Income and expense information is primarily used for tax reporting on the cash basis. Inventories, production records and financial analysis are maintained outside of your accounting system. Your balance sheet calculates net worth by subtracting liabilities from assets and values inventories at market value. You're recording double-entry transactions so that debits always equal credits and your balance sheet proves that assets equal liabilities plus owner equity. You post expense transactions through accounts payable and revenue through accounts receivable. You accrue expenses like interest and taxes when they are incurred rather than when they are paid. You're valuing inventories at cost or lower of cost or market basis. Costs flow through raw materials, work in process and finished goods on the balance sheet and are not recognized on the income statement until they are sold. Cash systems may use external software (like Finpack and AFRA) to make year-end accrual adjustments. Accrual systems may be able to generate cash-basis financial reports. Just because your accounting system can do accrual accounting does guarantee that you're doing it properly. Which brings us to Question Two: "Who oversees your accounting process?" If you already employ an on-site controller or CFO or you contract with a "virtual" accounting professional who oversees your monthly accounting processes then you have more capacity to move to the next level in your growth path than if either you or a family member with limited accounting training and time availability is trying to accomplish this on your own. However, if your operation already includes a family member trained (and tasked) in accounting you've (potentially) got the best of both worlds. Next month we'll address Step Two: What are your information goals?